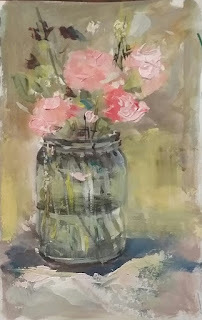 A study in gouache and palette knife. Went to Trader Joe's , purchased these yellow roses. The weather is still nasty and just needed a lift, so yellow roses is perfect for the rainy day blues. This is actually my entry for day 24 for the 31 day challenge. I've been getting up very early to paint and post. Don't trust this weather, power outages all over the Island, so far so good, we still have power. Okay, I need more coffee. Happy Painting everyone. This was a watercolor sketch from a set up, using Trader Joe's flowers. It was day 22 of the 31 day challenge. Used the palette knife. 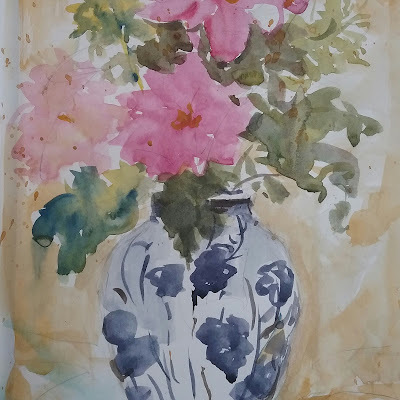 I worked using gouache. It was the first time that a palette knife was used for gouache. I use a knife at time for my oils. Today Long Island is in the midst of a storm with heavy winds. We may loose power. Hope everyone is enjoying their Monday morning. Happy Painting everyone. 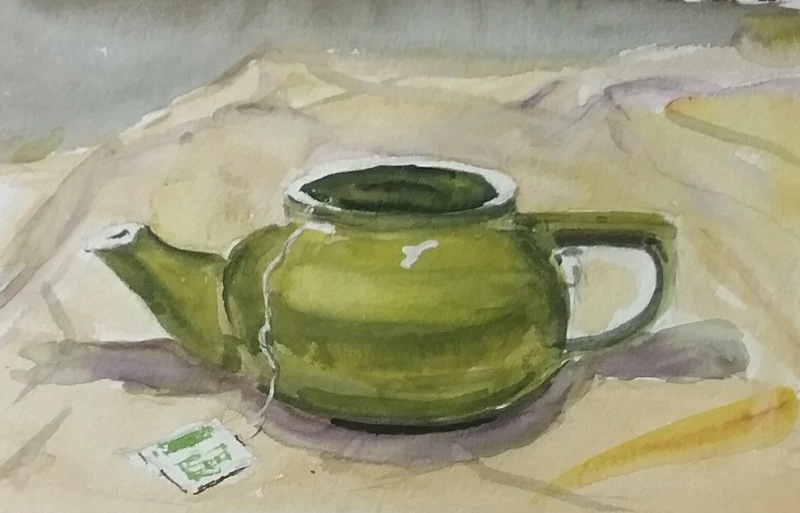 My little green teapot. I have been doing the 31 day challenge for stradaeasle on fb. Ten more days to go. I always thought these challenges help to improve an artist skills, and they do, if only they are thought as an end to a means. Sometimes we get overly critical. That is never helpful to the creative process. The last few days have been a struggle for me to just get through. 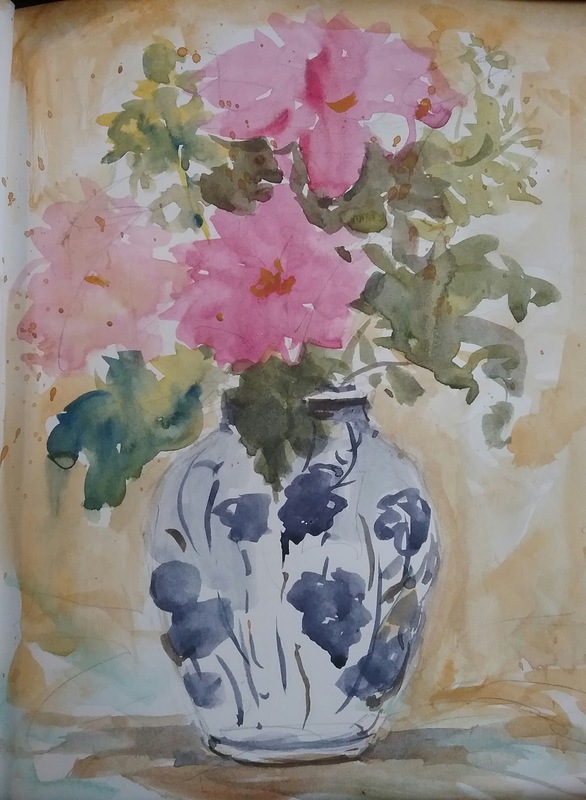 This sketch happens to be one of my better attempts at setting up a still life and painting from whatever I arrange. The one thing that has peaked my interest is, purchasing tea pots. I am waiting for my yellow tea pot, should get it soon. 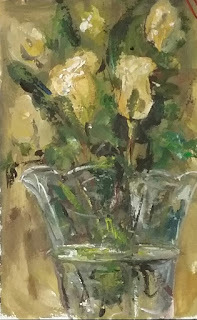 Miss painting in oil , I did start the challenge working in oil and those will be posted at a later time. Hope all is well with all of you and keeping warm if you live in areas where it is winter. Trying to get the correct photo. The first one was cropped. Waiting for spring. I did this quick watercolor sketch in my multi media sketch pad. I have been away for awhile. Busy with holidays and family. I began a 31 day challenge, I will post a few of my paintings tomorrow. Wishing everyone a very happy healthy new year . Happy Painting everyone.